Water soluble citrate salt of tetrodotoxin. Potent, selective and reversible, use-dependent inhibitor of voltage-dependent Na+ channels. To purchase this product, additional information may be required for security reasons. Please contact customer services for further details. Functional Studies - Tetrodotoxin citrate, Na+ channel blocker (ab120055)Marion and Hay PLoS One. 2011;6(12):e27581. doi: 10.1371/journal.pone.0027581. Epub 2011 Dec 2. Fig 5. 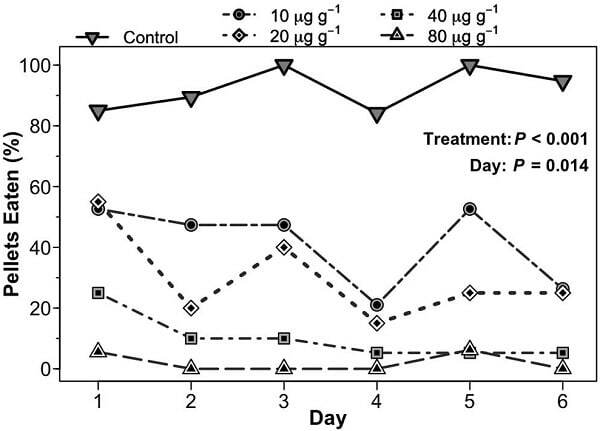 Percent of TTX-containing food pellets eaten by bluegill over 6 d of repeated feedings. Pellets were infused with different concentrations of TTX within the range found in newts from the field. P values are from likelihood ratio tests from a GLMM. Functional Studies - Tetrodotoxin citrate (ab120055)Image from Bertran-Gonzalez J et al., PLoS One. 2012;7(12):e53195. Fig 3(A). ; doi: 10.1371/journal.pone.0053195. Cell-attached recording of a striatal cholinergic interneuron depicting TTX (100 nM) inhibition of spontaneous action potential firing. The open bar indicates time of TTX application. Functional Studies - Tetrodotoxin citrate (ab120055)Image from Bertran-Gonzalez J et al., PLoS One. 2012;7(12):e53195. Fig 3(C). ; doi: 10.1371/journal.pone.0053195. Quantification of the p-S6rp signal in each striatal ChAt immunoreactive neuron after 1 hour incubation in control or TTX (1 M). Each dot corresponds to one neuron; each color corresponds to a different animal; dashed lines indicate the mean. Fluorescence values are normalized in arbitrary units (a.u.). Publishing research using ab120055? Please let us know so that we can cite the reference in this datasheet. What is the molecular weight of tetrodotoxin citrate? The datasheets for this product, ab120055, and tetrodotoxin, ab120054, give the same molecular weight (319.27) and same molecular formula (C11H17N3O8). The water-soluble TTX citrate ab120055 is not a citrate salt, it is simply TTX that has been dissolved in a citrate solution, and then lyophilized. So, it has the same molecular weight and formula as ab120054, which is soluble in pH 4.8 citrate buffer to 100 mM. Customer kindly contacted us regarding the difference between ab1202054 (TTX) and ab120055 (TTX-Citrate). I contacted the laboratory regarding the difference between ab120054 and ab120055, and they responded that the only difference between these two compounds is that TTX citrate (ab120055) is the water soluble version, which accounts for the difference in price. What are the proper disposal procedures for ab120055, and how should it be neutralized in case of a spill? Tetrodotoxin is very toxic and should be handled with caution. The safety datasheet is available from the datasheet. Additionally, to neutralize the toxin, you may use a freshly made solution of 0.25% NaOCl + 0.25 N NaOH or a solution of 0.5% NaOCl. Allow a 30 minute contact time. The spill must then cleaned up using absorbent material. The area must be further washed using a soapy solution to remove any residues. The spill material should be collected and disposed of as hazardous waste.